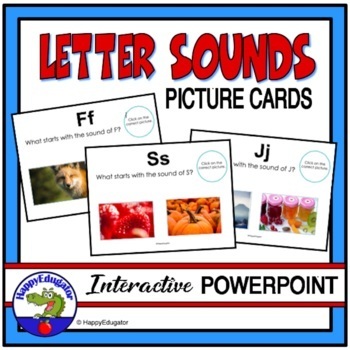 Letter Sounds PowerPoint. Consonant sounds and vowel sounds - long and short. This can be projected on a whiteboard or you can print these out on index cards and laminate. 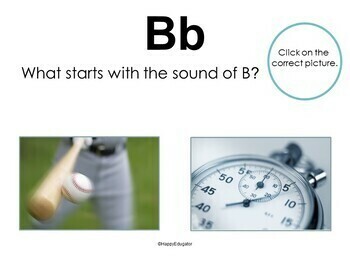 Beyond just letter recognition of the alphabet, saying consonant sounds is the first step in learning to read and the first evidence of phonemic awareness. Carefully go through each letter, and assess how well each student knows the consonant sounds. Explain to them that if they have difficulty remembering any of the consonant sounds, they should remember the key word pictured with each letter. 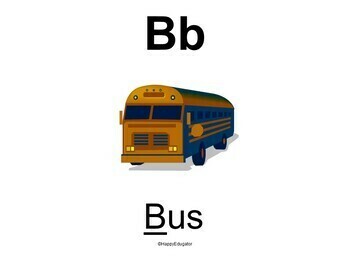 The key word for b, for example, is bus. Avoid as much as possible adding the uh sound after the consonant sounds, so that students will have less difficulty blending words when they start putting letters together. Useful for Letter of the Week activities. You can project this PowerPoint on a Smartboard, Whiteboard, make transparencies, or print out the slides on cardstock for flashcards and laminate for use in centers. Supports common core standards. Includes sound cards for all the consonants, and sound cards for the vowels a, e, i, o and u. 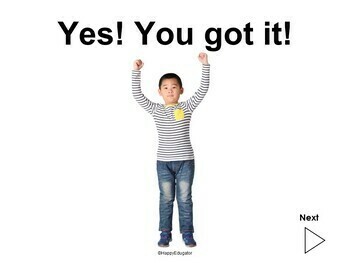 This is included in my Phonics PowerPoint Bundle. Short u Sounding Out words PowerPoint. CCSS.ELA-Literacy.RF.K.3 Know and apply grade-level phonics and word analysis skills in decoding words.